The Pre Order is now officially up on Smashwords.com. It should be available on Barnes & Noble, Kobo and Apple iTunes in a couple of days. Here’s the link: https://www.smashwords.com/books/view/413534. Remember, it’s only .99 for preorder, but after the release on March 31st it will go up to $3.99. As they neared the tree line she could make out a well-traveled pathway. It opened up as they entered it. The trees were gently swaying with the light breeze. She watched sunlight making its way between the branches. She noticed several large oak trees with moss hanging almost to the ground. She could smell the musty scent of the moss and old trees. It was weird how comfortable she felt with Anthony. Any other time she would have been a little leery of walking in the woods alone with a stranger, but he didn’t feel like a stranger. Then she started to see a clearing ahead. He turned to her and smiled. “It’s just ahead in the clearing. I think you will be surprised.” The excitement showed on his face. As they neared the clearing she noticed a tall wrought iron entranceway. It was amazingly ornate and beautiful. The cemetery was large. It was graced with a huge old live oak in the center of the graves. “My great-great grandfather planted that oak the day he buried his wife. It’s funny the similarities between you and her. Her name was Lilliana and he called her Lily. I didn’t mention it the other day because I didn’t think you’d be interested, but I can see you would.” He couldn’t help but stare at her. The resemblance was amazing. She was in awe of the beauty of the place. It was so peaceful. The only sound was the wind whispering through the trees and the slight tinkling sound of a wind chime, but where was it coming from. “I hear a wind chime. Where is it coming from?” She looked around the trees expecting to see it hanging somewhere among the sprawling limbs. “It’s on a stand beside the head stone of my great-great grandmother. It’s been there for as long as I can remember. Uncle Thomas has rethreaded it several times. Of course with age it has dry-rotted several times, but it was the dying wish of her husband to keep the wind chimes blowing.” He watched her expression as she looked stunned. “What’s on your mind? I can tell you are deep in thought.” He wondered what he’d said to affect her so. “Your uncle said you believe in previous lives. Can I tell you something?” She was still looking at the old oak tree. “I’ve always felt like I was an old soul. It’s weird but I feel like I’ve seen the house and yard before. You even look familiar to me, but I know I’ve never met you before the other day. Does that sound weird?” She finally chanced a glance at him. The sun was shining down on his dark hair and it glistened. She was struck again by the similarities in him and the man in her dreams. Well, that’s just a little snippet. I’ll be posting little hints all of March. Also, keep watching for some giveaways. I’m also offering 5 ARC copies to the first 5 people that direct message me. This book has been a long work in progress and I’m really excited about it. The cover is the brain child of my cover designer and myself. I’ve had in my mind what I wanted since I typed the first word. It turned out to be an awesome cover that expressed the way I feel about this book and the characters. 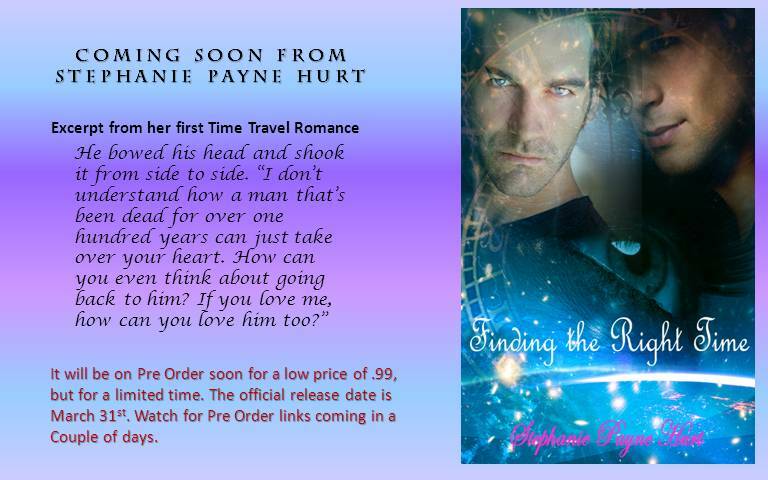 Categories: Uncategorized | Tags: Authors, Love, New Releases, Pre Order, Romance, Savannah, Smashwords.com, Stephanie Payne Hurt, Time Travel, Time Travel Romance, Writing | Permalink. I am revisiting an old post from almost 2 years ago. Wow, it’s hard to believe I’ve been blogging this long. Anyhow, this was one of my more popular posts from my blog over at CreateSpace. If you’re a fan, try to figure out which book I was working on. It was one of my favs. Also do you notice a phrase missing from this post that is always on my posts? Well, it’s Thursday morning. My son is at school and my hubby has gone to work. My mind in swirling with words to put into my current book. I am so excited about this new one. I just can’t seem to type fast enough to get the words out of my head. I can see the whole ending and I am chomping at the bit or keys as it would be. I worked last night in between watching “The Voice”. My son kept looking at me like I was crazy. I was actually smiling and chewing my lip as I typed. Have you ever been so into a manuscript that your every thought was focused on it? I had a new thought yesterday for a new spin that has totally rocked my manuscript. One of my characters is going totally on another direction from the original thought. It is funny how your mind works when you are into a manuscript. You think you have the right answers, but as you type your mind goes ahead of your fingers and totally changes everything. It is so cool how the process just develops on the scope of the work. I can’t tell you where the idea is going, because that would be a “spoiler”. I can tell you that my editor/assistant read up to what I had finished yesterday and she is now not speaking to me. She said she could not believe that I let her read it to that point and left her hanging over a cliff with no reprieve. I just smiled and knew I had accomplished what I wanted. I know I have said other books were my favorite, but I can honestly say this one has taken 1st prize in my heart. I have honed my writing skills and took into account different reviews of my other books. I have changed techniques and ways of describing characters and places. Just can’t wait to type the end, but then again it has been such a big part of my life for the past month or so that I will probably have withdrawals. LOL!!!? Categories: Uncategorized | Tags: Authors, Avon Romance, avonromance.com, blogging, fun, Old Posts, The Voice, Throwback Thursday, Writing | Permalink. Categories: Uncategorized | Tags: advertising, Pre Orders, Time Travel Romance | Permalink. Ok, if you’re a writer you know the questions I’m talking about. Sometimes I just have to laugh and try my best to answer the question in the best way I can as I laugh. It’s funny the things that people think about writers. 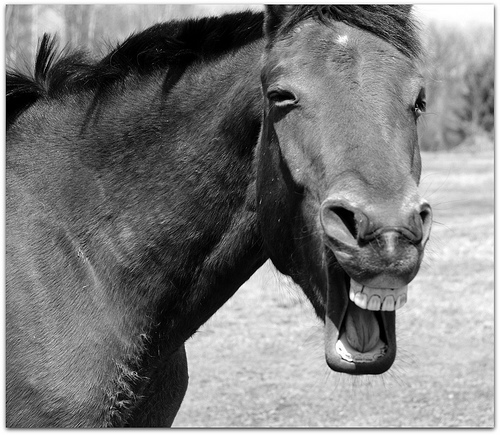 I had to post this picture because you know I love horses and these questions make them laugh too. 1: My favorite is “Did you write that book from an experience you had in your own life? That’s where most writers get their stories right?” Well, some of them have been from experiences but if my life was like a fairy tale, wow how would that be. Then I think of murder mystery writers and have to cringe. If all writing was strictly from personal experience the police would tail all writers obsessively! 2: Can you introduce me to your cover model? Really, you’ve got to be kidding me. I’ve never met any of my cover models. I did get a repin on Pinterest from one of them thanking me for using his picture on a couple of my covers. I was pleased, but I don’t know him personally so no, I can’t introduce you to my cover models. 3: You must be rich, huh? This one makes me laugh hard, really hard. Most published writers do it in their spare time and have a regular job. If not, we’d be really hungry artists. So, no, I’m not rich, not even close. I’m happy with my royalties and thankful to my wonderful fans, but I’m not quite ready to quit my day job. 4: So you can’t get published for real? This one ticked me off the first couple of times I heard it, but then I realized that there are so many people who don’t realize that a lot of authors do consider this a real business and take it seriously. This is a personal choice and I have been approached by publishers, but I am happy where I am for the time being. Then if it’s someone I’m close to I stick my tongue out at them in a very unladylike fashion and laugh. It’s become a really funny question as self publishing becomes the norm. So to me it’s a funny question. 5: Can I have your autograph? Now this one stunned me. Then I laughed because I’m not famous and this seems a little crazy, but I was humbled by it too. But I did laugh because I don’t think of it as being famous because I have several published books, but it’s really funny when someone comes up to me in a store and says, hey you’re that writer. What funny questions have people asked you? Some people might not think some of them are funny, but to a writer you’ll find the humor in them. Categories: Uncategorized | Tags: Authors, Avon Romance, avonromance.com, Fans, Funny Things, Humble, Publishing, Questions, Writers | Permalink. If you haven’t realized it yet, yep it’s Monday folks. School started back today after a very long break due to the ice storm and then Winter Break. The alarm clock went off at 6:00 this morning and it was rough. I’m working on my second cup of coffee and contemplating my third. Of course with Tax season in full swing my day is full of appointments for drop offs and pick ups. But for another hour I get to sit and enjoy my coffee, work on my upcoming book release and relax. This is my time when I can quietly work on things in the house. I already have a load of laundry and a load of dishes going. But more importantly I have a book to finish. Since I’m working on my first time travel romance, I’m excited about the upcoming release. I’m doing this one a little differently than my other books. It’s going to have a pre-order available through Smashwords. The pre-order will be on Barnes & Noble, Apple iTunes and Kobo. I will be running several giveaways and some free books to select people that win the drawings. The contest will be announced this week so keep watching. Several of my books will be up for grabs to those that pre-order my book and send me a picture of their pre-order confirmation, but I’ll announce the rules soon. As for the book that’s coming out, I think my fans will be surprised. I’m hoping it will be a pleasant surprise. This is a little step away from my normal writing, but of course there is still a handsome cowboy and horses, I have to keep that going. But I’ve never delved into the time travel genre. It’s been a great experience and I think it’s a story that will make you think and wonder all the way to the end, which is an interesting ending. Categories: Uncategorized | Tags: Announcements, Authors, Avon Romance, avonromance.com, Barnes & Noble, blogging, Books, coffee, Endings, Monday, Morning, Preorders, Rules, Soon, Surprises, time, Writing | Permalink. Smashwords Preorder – A Great Thing! I’ve been publishing with Smashwords for almost two years and it’s been a wonderful experience. As always they’re constantly adding new things to help authors. The Preorder choice has been available for several months. I tried it with Victoria, but I didn’t give it much time and wasn’t very successful. Totally my fault. I didn’t allow enough time to gather interest. But as always, we learn from our mistakes and try again as I will do with my newest book “Finding The Right Time”. Mark Coker has written a great post to help with the logistics of marketing your Preorder, setting it up and anything you’d need to know. It’s a wonderful tool and every author should try this out. I will be following his every instruction and look forward to how it works out. I will update this post when I know more. For now, here’s a link to the post from Mark Coker. If you’re an author you need to read it. If you’re a reader it could help you gather up some new books and have them as soon as they come out. Categories: Uncategorized | Tags: Authors, Mark Coker, Preorders, Publishing, Smashwords.com | Permalink. Ok, admit it, writers are a different breed. We think different from other people. Our thought processes are strung out amongst several things and stories. It’s amazing how many things a writer has going on in their head. We’re constantly thinking of the story in the works or the story not yet written. 1: Sleep with a pad and pencil beside the bed. You wake in the middle of the night with a story or character idea and you just have to get it on paper. 2: Google strange topics. When you’re writing there’s always that one topic that you’re not that familiar with and you have to google it. Let’s just say some of the things you google could get you watched by the powers that be. Think about some of the things you’ve googled lately. Yeah, those are the one’s. 3: Someone tells you something that happened to them and you suddenly start taking notes. 4: You’re watching the evening news and get a sudden urge to start a new story. Yep the top story just inspired you to write. 5: You have notes written on anything that you can find. I’ve used napkins, envelopes, corners of newspapers, whatever is available. 6: Stare off into space. Yep, the story is taking over your brain and you get lost in the thought. 7: A story unfolds in your brain as you sleep, you wake up and struggle to go back to sleep to see how the story ends. 8: You talk about your characters as if they’re real people. To a writer they are real. That’s only eight, send me more. The list could go on forever. Writers are different and we’re alright with this. Categories: Uncategorized | Tags: Authors, Avon Romance, avonromance.com, Mystery, Romance, Strange Things, Style, Writers, Writing | Permalink.